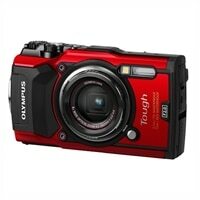 Olympus Tough TG-5 Digital camera compact 12.0 MP 4K / 30 fps 4x optical zoom - redBuilt for adventure. Designed to bring back amazing looking souvenirs. The Tough TG-5 is packed with pro features that help you nail bright, crisp outdoor shots even in challenging conditions. You'll find imaging firepower that's optimized for shooting action.